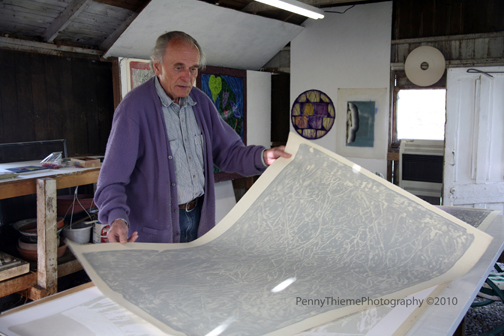 In his new studio ("The Chicken Coop"), on his 75th birthday, Zig pulls out lithographs dating back to the 1970's to be utilized in his current work. The prints themselves, historical accounts of Priede's creative processes, will soon succumb to the accumulation of nearly 40 years of the artists experiences. At the master's hands, these works are destined to become the most recent visual record of Priede's own lifetime. Many of my works begin with some kind of printing process and develop through the use of collage, paint, and other materials. The presence of hand, automatism, and fortuitous happenings are all significant ingredients. The works are abstract with emphasis on form as foundation and meaning. They form relationships augmented with semiotic associations that need not have specific or exclusive meaning. Diverse viewer interpretations of these associations become an accumulation of meanings over time. Because these works evolve over a prolonged period of time that may extend many years, I choose to call them ‘aggregate time’ works. They represent certain moments of a creative process that is forever ongoing, like the interpretive process.